The CONCACAF Gold Cup is underway and on various sports channels right now so as I was scratching my head, pondering what to do next, I figured it out: I'll combine my love of soccer with my love of flags and break down some of the nations involved in the tournament. We've got three doubleheaders lined up to round out the month of July and first up, we're starting right in the middle with the Central American neighbors of Costa Rica and Panama! Adopted November 27, 1906 for national and civil usage, it was designed by Pacifica Fernandez who was in turn inspired by the 1848 Revolution in France and the creation of the French Second Republic. The blue-white-red combination is taken directly from the French tricolor. 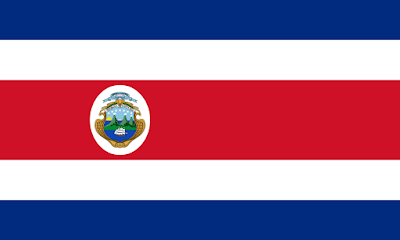 (It's similar to the flag of Thailand and the flag of North Korea as well- but both of those were adapted after the flag of Costa Rica.) Color wise: the blue stands for the sky, opportunities, idealism and perseverance. The white is for peace, wisdom and happiness. The red is for the blood spilt by martyrs in defense of the country and the warmth and generosity of the people. The Coat of Arms (although you can't see it all that well on this image- try this link if you want something a little bigger)- features the isthmus between the Pacific and Caribbean with 3 volcanoes. 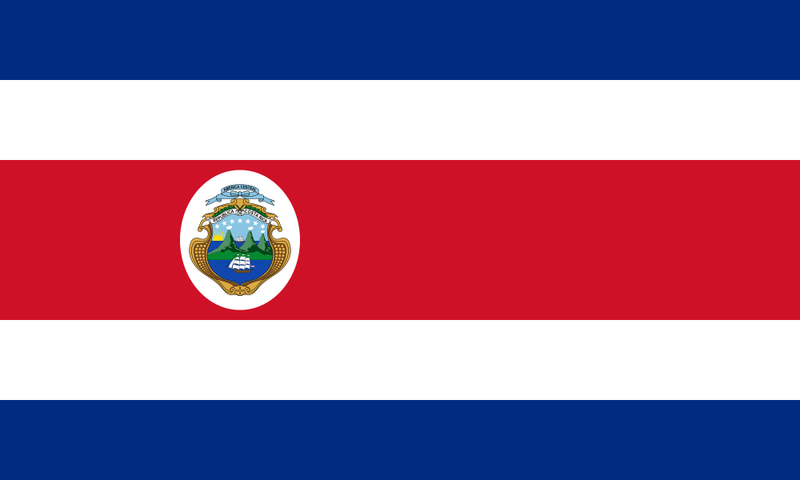 The seven stars stand for the seven provinces of Costa Rica- the Spanish name for the country is scrolled on a white banner and the blue upper scroll recalls the United Provinces of Central America. I've actually got this one somewhere in the collection (Vexillology Dream/Goals: a better way to display my collection as well as adding to it.) The first thing that's important to know about Panama's flag is that it could have looked like this flag, which to me, is cooler. The Bunau-Varilla proposal might be a little too similar to that of the United States- so I can understand why people might be a little leery of it, but damn are the colors striking and the proposal... it just looks good. 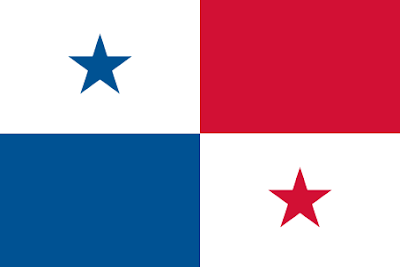 But here's the crazy thing: I actually like the current flag of Panama as well. The design is simple, has symmetry and it's got a simple meaning: the was the color of the Conservative Party, red the color of the Liberal Party and white is the peace they operate together in. It was adopted on March 25, 1925 for national and civil usage. So, there you have it, the first of the Gold Cup Doubleheaders is in the bag! Remember, until next time keep your flags flying- FREAK or otherwise!